Alexander BALCOM Jr. (1661 – 1728) was Alex’s 8th Great Grandfather, one of 512 in this generation of the Shaw line. 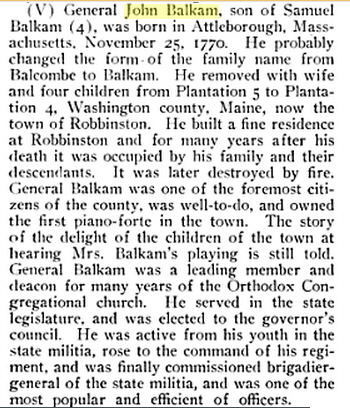 Alexander Balcom was born before 1661 in Providence, Rhode Island. His parents were Alexander BALCOM Sr. and [__?__]. He married Sarah WOODCOCK about 1690 in Rehoboth, Bristol, MA. He settled in Attleborough before 1692. Alexander died 31 Jan 1727/28 in Attleboro, Mass. 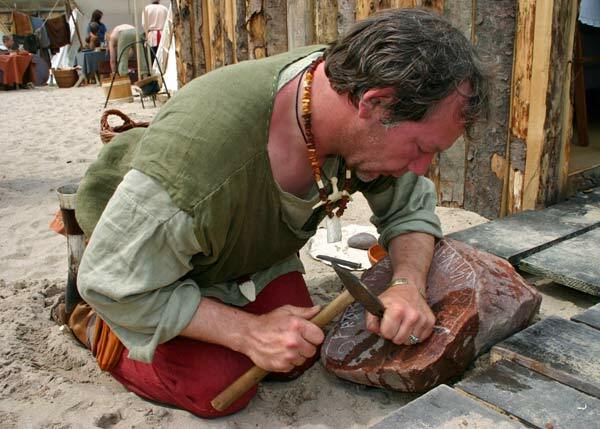 Alexander Balcom was a stone mason like his father. Sarah Woodcock was born 2 Aug 1667 in Hingham, Plymouth, MA. Her parents were William WOODCOCK and Mary [__?__]. Sarah died in 29 Nov 1726 in Attleboro, Mass. 21 Mar 1734 Attleboro 17 Dec 1787 Attleboro, Mass. Alexander was a stonemason by trade. He took the oath of allegiance to the English crown in 1682. He bought of his father-in-law twenty acres of land 29 May 1701. and another parcel of twenty acres 17 Feb 1707/08, of his mother-in-law, Mary Woodcock, and other heirs of William Woodcock. Bolkcom, Alexander, 1st. who came to Attleborough previous to 1692, from whom all in town’ are descended. He came from Providence and was a mason by trade. He married Sarah Woodcock, daughter of John Woodcock. Sr., and had seven children: William, born September 3, 1692; Katherine, bom February 7, 1694; Alexander, born April 4, 1696; John, born April 29, 1699; Baruck, born June 12,1702; Sarah, born February 8, 1703-/04; Joseph, born February 23, 1705/06. He died January 31, 1727/28. His son William married Mary Tyler. October 3, 1713; Alexander married Martha Rockinton, of Needham, May 14, 1725 —intentions entered April 8. 1725; Baruck married Patience Blake; John married Mary Grover, by whom he had five children, and afterwards’Sarah Grover. by whom he had eight children; Joseph married Mary Parminter, March 21, 1733/34. Land – 1701 Attleborough, Mass, Purchased from William Woodcock, his father-in-law. Land – 1708 Attleborough, Mass, Purchased 20 acres from, among others, Sarah Woodcock, his mother-in-law. Death – 31 Jan 1727 Large inventory in his will, included money, livestock, “silver sleeve buttons”. Wife Sarah was named as Administrator. iii. William Balcom b. 4 May 1726 Attleborough, Mass. ; d. 9 Jun 1726 Attleborough, Mass. ii. Andrew Starkey b. 13 Mar 172-. Attleboro; m. Sibil Fisher of Norton, May 4, 1749. Alexander’s wife Martha Obinton was born 14 Apr 1696 in Needham, Norfolk, Mass. Martha died 31 Jul 1781 in Needham. Alexander died of a gall stone, according to Genealogy of the Balcom Family, page 6. His wife, Martha Obinton was born about 1696 in Needham, Norfolk, Mass. Martha died 31 Jul 1781 in Needham, Norfolk, Mass. ii. Alexander Balcom b. 25 Jul 1729 in Attleboro, Bristol, Massachusetts; m. 17 Jan 1750 in Norton, Bristol, Mass. to Hannah Shepardson. His will, dated Sep 22, 1808 and probated Apr 4 1809, mentions wife Hannah, daughter Hannah [wife of Samuel Tiffany, of Attleboro. Samuel’s parents were Samuel Tiffany and Mary Richardson and his maternal grandparents were our ancestors Francis RICHARDSON and Sarah HOUGHTON Samuel’s brother Daniel married Hannah’s cousin once removed Bersheba (See below). ], heirs of son David Balcom, Deceased, son Elijah, daughters Lucinda Halsey and Sarah Blake. John’s first wife Mary Grover was born in Norton, Bristol, Mass. Her parents were Ephraim Grover and Mary Pratt. She married John in 1720 in Norton. . Mary died 4 Jan 1733 in Norton, Bristol, Mass . John’s second wife Sarah Grover was born 28 Nov 1709 in Norton, Bristol, Mass. Her parents were Andrew Grover and Mary [__?__]. Sarah died 19 Nov 1756 in Smithfield, Providence, Rhode Island. John’s third wife Martha Ockington was born 28 Nov 1709 in Norton, Mass. Martha died 31 Jul 1781 in Smithfield, Rhode Island. i. Mary Balcom b. 14 Dec 1722. m. John Fisher on 23 May 1751.
ii. John Balcom b. 24 Jul 1724; m. Mary Jewett on 8 Nov 1750.
iii. Abigail Balcom b. 23 Jun 1726; m. Ebenezer Short on 18 May 1749.
vi. Samuel Balcom b. 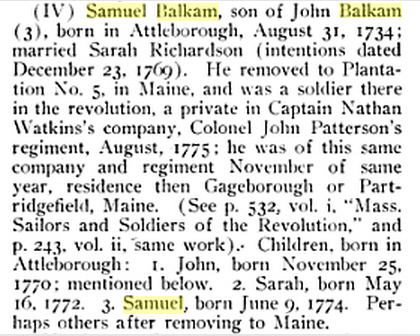 31 Aug 1734; d. 20 Jan 1810 in Attleboro; m. 23 Dec 1769 in Attleboro to Sarah Richardson (b. 7 Oct 1742 Attleboro, Bristol, Mass – d. 16 Nov 1815 Claremont, Sullivan, New Hampshire) Sarah’s parents were Jonas Richardson and Mary Cutting. Her grandparents were Francis RICHARDSON and Sarah HOUGHTON. Sarah’s cousin Daniel Tiffany married Samuel’s sister Bersheba and her cousin Samuel Tiffany married Samuel”s cousin once removed Hannah. (See above) Sarah and Samuel had seven children born between 1769 and 1790. Balckom, Daniel, Attleborough.Private, Capt. Moses Knap’s co., Col. Joseph Reed’s regt. ; muster roll dated Aug. 1, 1775; enlisted May 8, 1775; service, 3 mos. 1 day. Balcom, Daniel, Attleborough.Private, Capt. Thomas Hunt’s (8th) co., Col. Henry Jackson’s regt. ; Continental Army pay accounts for service from June 28, 1777, to May 15, 1779; reported deserted May 15, 1779; also, Capt. James Jones’s co., Gen. Jackson’s regt. ; pay roll for Feb., 1778, dated Guelph, Pa.; also, pay rolls for June, July and Aug., 1778, dated Providence; also, pay roll for Sept., 1778, dated Pawtuxet; also, pay roll for Nov., 1778; also, pay rolls for Feb.-April, 1779, dated Pawtuxet; reported on command at Newtown in April; enlistment, 3 years. Baruch’s wife Patience Blake was born 1705 in Attleboro, Bristol, Mass. Her parents were Jonathan Blake and Elizabeth Candage. She married Baruch 16 Dec 1738 in Attleborough, MA. Patience died in Beaufort, North Carolina. Listed as Baruck Balkum on both the census and the tax roll in 1755, Beaufort County, North Carolina. Ichabod enlisted in the 3rd South Carolina Regiment of Continentals, commanded by Col. William Thomson on Feb 9, 1779 as a private. Company pay rolls indicate that he served until Nov 1, 1779 in this regiment. ii. Patience Balcom (Twin) b. 2 Apr 1741. Sarah’s husband Richard Atwell was born about 1704. His parents were Richard Atwell and Lydia Felt. After Sarah died, Richard married age 37 on 9 Apr 1741 in Providence, Rhode Island to Mary Lawrence. He married third to Age: 52 on 30 Dec 1756 to Sarah Nichols. Richard died 26 Jan 1767 Attleborough, Mass. i. Sarah Atwell b. 11 Jun 1728 Attleboro, Bristol, Mass. ; d. 1747 Attleboro;. m. 23 Dec 1742 Cumberland, RI. to Josiah Cook. ii. Amos Atwell b. 20 Oct 1730 Attleborough, Mass. ; d. 10 Aug 1807 Providence, RI. ; 14 Nov 1754 Providence, RI. to Elizabeth Searle. iii. Mary Atwell b. 1 Jan 1732/33 Attleborough, Mass. iv. Ann Atwell b. 8 Oct 1735 Attleborough, Mass. v. Richard Atwell b. 18 Jan 1737/38 Attleborough, Mass. This entry was posted in 10th Generation, Line - Shaw and tagged Attleboro, Col. Henry Jackson's Regiment, Col. Joseph Reed's Regiment. Bookmark the permalink. 13 Responses to Alexander Balcom Jr.
Hi , thanks for this, it’s awesome. I believe, if I’m correct, that I’m Alex and Sarah Woodcock’s 8th great granddaughter: Alex, Alex, Alex, David, Peddy/Pedda who married David Bryant, Sylvanus Jefferson Bryant, Violet Evaline Bryant m. George Lilienfeld, my grandmother, my mom and then me. After going through everything I could find on line and doing a Baucom Y DNA project there are at least three different Baucom lines of various spellings in NC by 1750: 1. My John’s parents James Baucom and Frances Drake; Nicholas Baucom and wife Sarah Lee who some believe came to NC from MD; and Barauch (sp) Balkcom who came from MA to NC. Do you know of any male Balkcom related to Barauch who has been Y DNA tested?